Man, I can't remember when was the last time I saw a movie that I just had to watch again. I'll probably watch it at least two more times before it goes back into the mail. 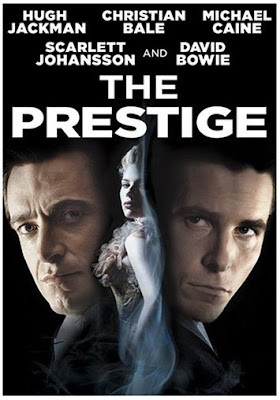 The Prestige, directed by Christopher Nolan (from a script he co-wrote with his brother Jonathan based on a novel by Christopher Priest) is about the bitter rivalry between two magicians at the turn of the twentieth century. Alfred Borden (played by Christian Bale, who was also in Nolan's Batman Begins) and Robert Angier (Hugh Jackman aka Wolverine from the X-Men movies among other things) start out as friends who work as "ringers" for a veteran magician. Then during one night's performance something goes horribly wrong with an act and Angier's wife is killed. Angier blames Borden for what happened. That's all I really want to say because The Prestige really is a movie that someone should go in fairly unawares on. Very enthralling, oftentimes horrifying and thoroughly entertaining, The Prestige is recommended viewing not once, but twice. Maybe even three or four times. The only real question is: "Are you watching closely?" I totally agree with your review on all counts. I also had to see it twice to take everything in. It ended up being my 2nd favorite movie of 2006, closely behind "Akeelah and the Bee" in my top spot. It's one of those movies where everything is top quality: acting, writing, directing, art direction, special effects, editing, etc. I'll probably buy it on video soon too. Argh. I proof-read my comment but didn't proof-read my name. That's "todd w" not "todo w".